Smog in the city. Photo by A30_Tsitika. 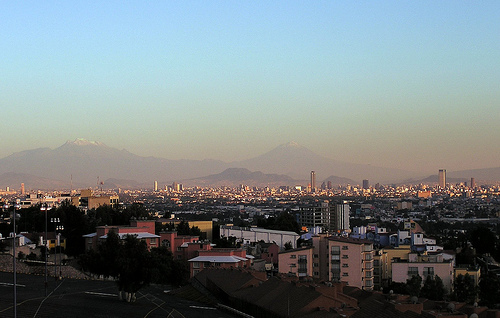 Residents of Mexico City have a much poorer sense of smell than their counterparts in the neighboring state of Tlaxcala due, in large part, to the poorer air quality in the Mexican capital. A study by Robyn Hudson, Aline Arriola, Margarita Martinez, and Hans Distel – researchers at UNAM, Mexico’s national university – suggests that the cause is exposure to abnormally high levels of ozone, a chemical compound known to damage the olfactory mucosa, the part of the nose that allows odors to be detected. “For a megacommunity like Mexico City with more than 20 million inhabitants, this could constitute an important public health issue,” the researchers wrote. The study notes that chilangos, as residents of Mexico City affectionately refer to themselves, had more difficultly identifying trace smells of coffee and orange juice than people who live in neighboring Tlaxcala. What’s more, they had more trouble differentiating between two traditional Mexican drinks, horchata and atole. For sometime it has been known that air pollution causes all sorts of health problems, including ailments like asthma, bronchitis, and irregular heartbeats. Thanks to this study, we now know that it’s stripping people of one of their most basic and primordial ways of interpreting the world – their sense of smell.